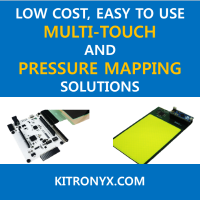 Kitronyx is an engineering company that provides development tools and engineering design services to individuals, companies, universities and government agencies based on expertise in force, pressure, and multi-touch technologies. Our focus is on providing the ‘closest to complete’ technology to enable customers to rapidly turn ideas into real products. Customers who wants to embed or prototype pressure distribution sensing, force measurement, multi-touch position sensing and gesture recognition have difficulties to find a reliable turn-key solution provider. Our rapid prototyping techniques, combining hardware, firmware and software base modules along with custom development, can quickly prove a concept and act as a platform for further development. Learn More.